Beautiful Raven's Nest In Paradise Retreat w/ Solar Heated pool & Hot Tub! Raven's Nest is a beautiful Four bedroom, Two bath home within walking distance of the Gulf of Mexico!! Relax and enjoy Destin's beautiful white sand beaches and stunning evening sunsets!! 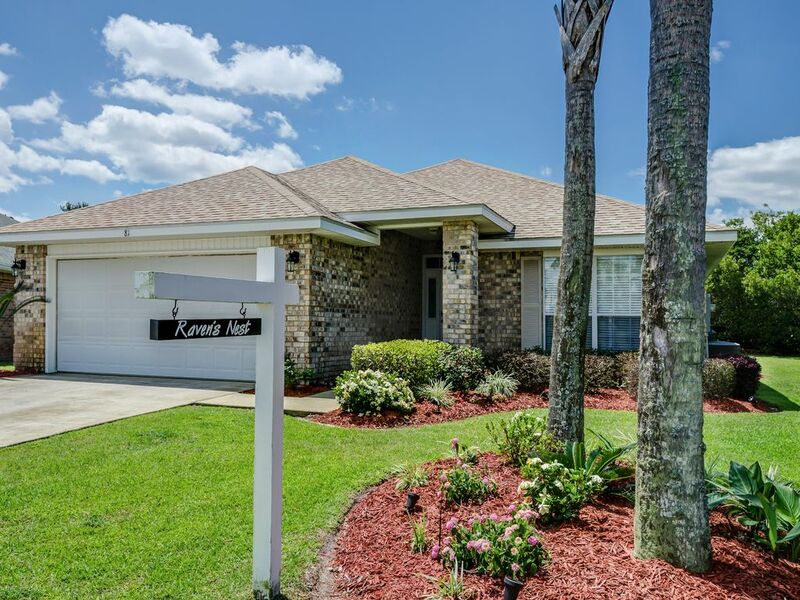 Home is located between Emerald Coast Parkway and Scenic Gulf Drive. Beautifully decorated home features Master bedroom with King size bed, TV, phone, large walk-in closet, and a spacious private master bath walk in Shower, and double sinks. Three additional bedrooms include two queen beds, and two captain twin beds. All bedding with comfortable Serta mattresses for a good nights sleep. Queen size sofa sleeper too! Fun Fun Fun! : The Track Amusement Center in Destin, Florida offers mini golf, Water Bumper Boats, go-carts & for those not faint of heart, Bungee Jumping. The master bedroom has an attached bath. The second bathroom is located between the bedroom with the twin beds and one of the queen bedrooms. We also have provided a high chair for our littlest guests. The house was excellently maintained and Kathy was very helpful! Kathy (property manager) was very kind and very responsive on our day of arrival to the house. Her email communications were very helpful at the time of booking, as well as the day prior to our departure and arrival back home. This home is lovely and well cared for. We were very pleased with our stay! Loved the whole area of Miramar Beach and Destin. The house was fully equipped with everything you would possibly need. Beds were very comfortable and the place was very clean. Mary (the owner) was very nice and helpful. Kathy (the manager) was also very nice and helpful. She even called to check to see how we were doing. We have already booked for next year and can’t wait. Thank you for this lovely review! I am so pleased that you enjoyed your stay! I hope you have a wonderful year and we look forward to seeing you again next winter! Great home, had everything that we needed for our visit. We are repeat visitors, and the home is well maintained, and perfect for our needs. The pool out back is great, the house is clean, and the location is fantastic. Thanks Mary, can't wait to come back! Thank you for submitting this lovely review! I am so pleased that you enjoyed your stay once again!!! I hope you come back again soon!!! This home was more than we expected! It was beautiful and clean. The rooms were spacious and the beds were comfortable. The kitchen was large and had what was needed to cook meals. The pool and patio was beautifully landscaped and a really nice size. The neighborhood is quiet and the neighbors were friendly. We loved this property and would definitely recommend it!!!! The owner responded quickly to all questions that I asked and gave good and complete instructions for codes and checkout. We loved this rental and had a wonderful week! We had 6 adults, 3 were adult children and we all loved this property! Thank you for this lovely review!!!! I am so pleased that you enjoyed your stay and I hope we will see you again soon!!! I am so pleased that you enjoyed your stay! I hope you will co.e back soon and often!